Each fall, representatives from UC, CSU and Private Universities (both in California and out of state) attend Transfer Day to answer questions regarding transfer admission requirements, major preparation courses, minimum GPA's for high demand majors, student housing, financial aid and more! 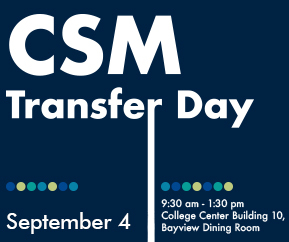 Information about special transfer events specifically for CSM students during the fall semester is available as well. CSM Financial Aid staff and the Scholarship Office are present to answer questions regarding FASFA and requirements to qualify as a transfer student receiving Financial Aid as well as transfer scholarships available to qualified students. Members of the Associated Students of College of San Mateo (ASCSM) and Student Senate will be present to provide information about how to get involved in student government and clubs. Participating in student government and student clubs can make students more competitive when applying to highly impacted universities.